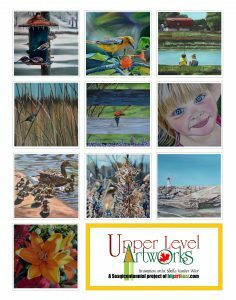 Works by Brampton artist Sheila Vander Wier compiled for Upper Level Artworks A Sesquicentennial Project of Big Art Buzz. which showcases a total of 150 works for Canada’s 150th. This is the 13th posting of the 15 portfolios. Accepted into the Open Juried Fine Art Show that will be on display at the Beaux Arts Gallery, 70 Main Street North, Brampton from March 21- April 15th. Open reception on Thursday April 6th 7-9 pm. Sheila also had “Our Provider” accepted into this exhibit. Growing up I always enjoyed art. Whenever I had a chance during my travels I would visit art galleries and be in awe of the artists creations. I am a self taught artist who is inspired by the beauty of God’s creation. I enjoy the challenge of creating with oil and acrylic on canvas. I thank the Lord for giving me such a wonderful gift that I can share with others. Show and Wildlife Show at Beaux-arts in 2012. Receiving honorable mention and peoples choice award has inspired me in my art work. Over the past years I have also painted set piece for the Brampton Music Theater and it is a thrill to see everything come together on stage. This is been a great adventure and looking forward to what the future holds.